Hilton Garden Inn Buffalo Downtown is a 124-room, full service hotel consisting of suite and standard hotel rooms with stunning views of the city. The hotel also includes a lobby bar, full-service restaurant open for breakfast, lunch and dinner and 3,800 square feet of meeting and banquet space. Hamister Group, LLC purchased the historic Tishman Building in downtown Buffalo, NY in December 2012. 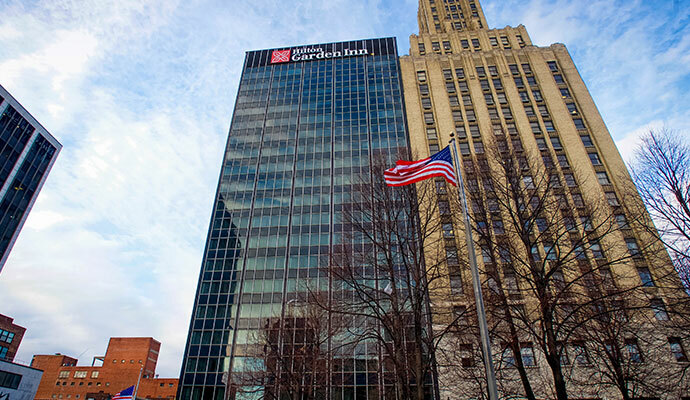 Now known as 10 Lafayette, Hamister Group transformed the building into the mixed use property it is today, with the Hilton Garden Inn Buffalo Downtown opening for business in 2014. The hotel occupies the first 14 floors of the building, followed by three floors (15-17) consisting of eighteen luxury apartments, and concluded with Hamister Group, LLC's corporate headquarters on the top three floors (18-20). For room reservations, call (716) 848-1000 or book your room online at www.buffalodowntown.hgi.com.